The lemon room at Royal Fairy Academy was humming with excitement. I couldn’t sit still. My wings were fluttering nonstop. Our teacher, Lady Cherry, was talking about Parent Night. It was three days away. All the royal parents of first-year students were invited to school for a special night filled with candy surprises. “I am working on it,” I told her. I sighed. I didn’t know what to make for Parent Night. We had to make a candy different from our own talent. Since I am a Chocolate Fairy princess, making mini chocolate chips is my talent and how I got my name! 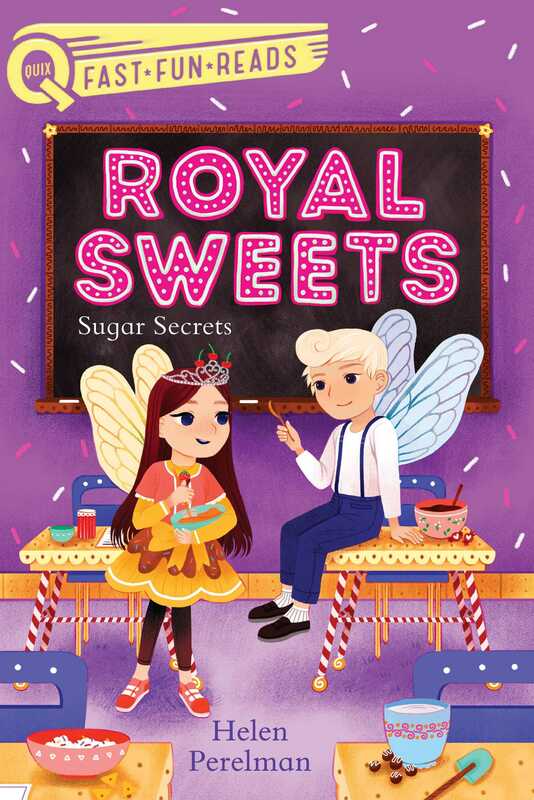 My mother, Princess Lolli, was a Candy Fairy princess and my dad, Prince Scoop, was an Ice Cream Fairy prince. Mini chocolate chips taste great in candy and ice cream. What was I going to make for the ruling royalty of Candy Kingdom? Sometimes being a fairy princess was a whole lot of pressure. “Can we work with a friend?” Princess Cupcake asked. She flipped her long blond hair to one side. She smiled at Lady Cherry. Her smile might have been sweet, but Princess Cupcake was not all sugar. She was my cousin and Prince Frosting’s twin. Prince Frosting was in our class too. I knew Princess Cupcake was not thinking of working with him. Cupcake had her eye on her best friend, Princess Swirlie. The two of them together were sticky icky. “I hope we don’t have to work together,” Prince Frosting burst out. He gave Cupcake a sour look. Princess Taffy, my best friend, tapped my arm. “Did you decide what to make?” she asked. “I am sure your parents will love them,” I told her. Maybe Taffy could help me make taffy. She was a Taffy Fairy from Sugar Kingdom. She had been trying all sorts of flavors lately. I was her best taster! The class lined up for dismissal. Everyone was talking about what they were going to do for Parent Night. I looked over at Frosting. He wasn’t saying a word. “Do you know what you will make?” I asked. Princess Sprinkle was my aunt and also the ruling fairy of Cake Kingdom. She was very kind. I thought she would love anything Cupcake and Frosting made for her. It was hard for Frosting to be twins with Cupcake, but I also knew he could be very sneaky. I was careful not to tell him anything if I didn’t want other fairies knowing. “What are you planning?” he asked as he zippered up his bag. “Not sure yet,” I said. My wings twitched again and I bit my lip. I wanted my parents to be proud. I knew they would expect something special from me. Whatever candy I made, it would have to be sugar-tacular!